FundInvoice | IFaware - Are You Dogged By Cash Flow Problems? #IFaware - Are You Dogged By Cash Flow Problems? Following the lauch of our #IFaware campaign, to raise awareness of invoice finance, we have released this second unbranded advert - "#IFaware - Are You Dogged By Cash Flow Problems? Have You Heard Of Invoice Finance?" which we ask that you to help promote. We would very much appreciate you sharing the campaign, instructions on how to do this via your website and social media, are below. Are You Dogged By Cash Flow Problems? Please use the hashtag #IFaware on social media so we can thank you for your support. <a href="https://www.fundinvoice.co.uk/invoice-finance/invoice-finance/ifaware-dogged-by-cash-flow-problems.html" ><img src="https://www.fundinvoice.co.uk/images/ifaware-dogged-by-cash-flow-problems.jpg" alt="Raising Invoice Finance Awareness" width="450" /></a><br /><a href="https://www.fundinvoice.co.uk/invoice-finance/invoice-finance/ifaware-dogged-by-cash-flow-problems.html" >Building Invoice Finance Awareness</a> with the <a href="https://www.fundinvoice.co.uk/" >FundInvoice #IFaware Campaign</a>. 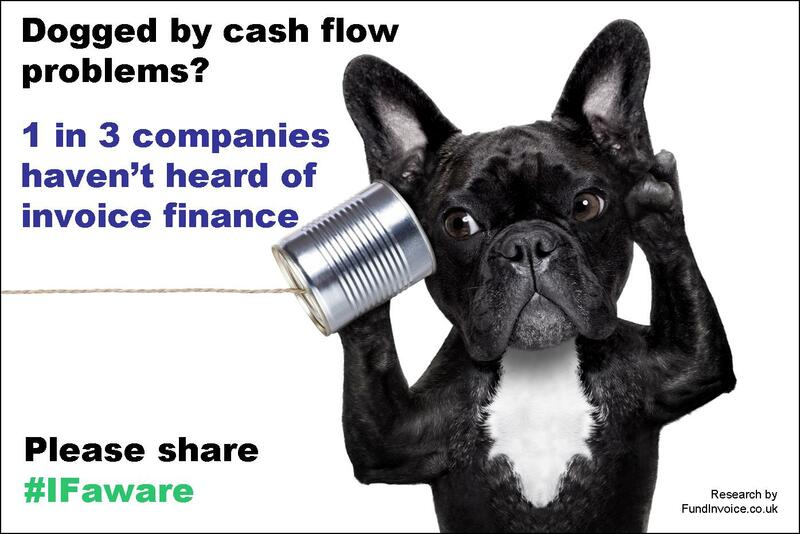 <a href="https://www.fundinvoice.co.uk/invoice-finance/ifaware-dogged-by-cash-flow-problems.html" ><img src="https://www.fundinvoice.co.uk/images/ifaware-dogged-by-cash-flow-problems.jpg" alt=" Raising Invoice Finance Awareness" width="1000" /></a><br /><a href="https://www.fundinvoice.co.uk/invoice-finance/invoice-finance/ifaware-dogged-by-cash-flow-problems.html" >Building Invoice Finance Awareness</a> with the <a href="https://www.fundinvoice.co.uk/" >FundInvoice #IFaware Campaign</a>. More Information About Invoice Finance? If you want to find out more about invoice finance we have information available.